Dragonball is a Japanese anime series that ran from 1986 to 1997 in three different incarnations; Dragonball, Dragonball Z and Dragonball GT. The rest of the world picked up on the phenomenon near the end of its Japanese run when, in 1995, the USA started airing an English dubbed and heavily censored version of the show. Since then, Dragonball, in its dubbed form, has screened almost continuously somewhere in the world. I was introduced to the show in 2001 when the younger brother of my then girlfriend kept suggesting that I watch it. When I did finally sit down to watch the show I was quickly hooked. So my expectations for seeing this live action film were pretty high, even though the trailers I had seen for it were pretty average. 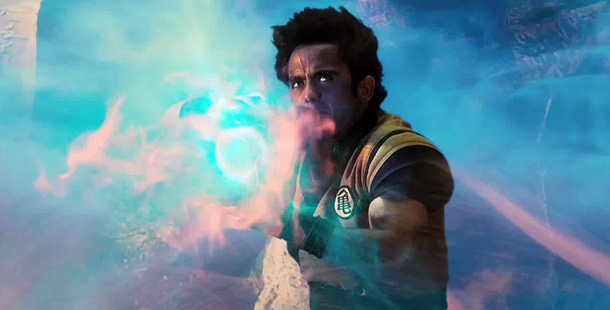 The film follows the young Goku, Justin Chatwin, who is raised and mentored by his grandfather, Gohan, in the ways of martial arts and the focusing of his Ki, which can be used for powerful attacks. On Goku’s 18th birthday, Gohan imparts a gift to him of a 4-starred Dragonball and is told to guard it with his life. Goku’s Dragonball is one of 7 in existence. If all 7 Dragonballs were to come together into the hands of one person it would give the holder of the balls a perfect wish. This means that powerful people are after them, including the alien Lord Piccolo, James Maters. After Gohan’s death at the hands of Lord Piccolo, Goku and his rag tag group of friends go on a journey to find the remaining Dragonballs and to stop Piccolo from gaining his one perfect wish, to enslave the world. There’s a long, and I mean long, list of things I could say about why this film just didn’t work but, to be honest, it would frustrate me even more just thinking about it! It’s one thing to be disappointed by a film and another altogether for a film to pretty much destroy great source material and make a mockery of everything you thought it should have been. Suffice to say, I was really disappointed by this film and the fact I give it 6 out of 10 is only because I love the Dragonball series so much. If I had seen this film not knowing anything about that series it would have been lucky to get 4 or 5 out of 10 from me. It has beautiful visuals/character design, some truly funny comedy, and stylish fight scenes. Those things add up to a solid anime adventure.